Imagine walking into a restaurant and finding chlorinated hydrocarbon pesticides, or neonicotinoid insecticides listed in the description of your entree. They may not be printed in the menu, but many are in your food. These are a few of the literally millions of pounds of approved synthetic substances dumped into the environment every day, not just in the US but around the world. They seep into our water supply, are carried thousands of miles by wind and rain from the site of application, remain potent long after they are deposited, and constitute, in the words of one scientist, “biologic death bombs with a delayed time fuse and which may prove to be, in the long run, as dangerous to the existence of mankind as the arsenal of atom bombs.” All of these poisons are sanctioned--or in some cases, ignored--by the EPA. For twenty-five years E.G. Vallianatos saw the EPA from the inside, with rising dismay over how pressure from politicians and threats from huge corporations were turning it from the public's watchdog into a "polluter's protection agency." 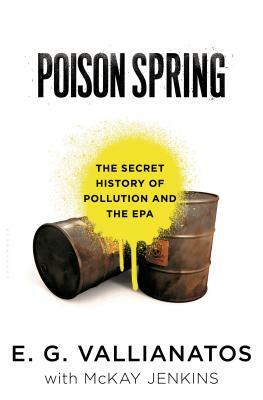 Based on his own experience, the testimony of colleagues, and hundreds of documents Vallianatos collected inside the EPA, Poison Spring reveals how the agency has continually reinforced the chemical-industrial complex. Writing with acclaimed environmental journalist McKay Jenkins, E.G. Vallianatos provides a devastating exposé of how the agency created to protect Americans and our environment has betrayed its mission. Half a century after Rachel Carson's Silent Spring awakened us to the dangers of pesticides, we are poisoning our lands and waters with more toxic chemicals than ever. E.G. Vallianatos is the author of five books, including Harvest of Devastation and This Land is their Land, as well as over a hundred articles, including recent pieces in Alternet and Truth-Out.org. He worked in risk evaluation at the EPA for twenty-five years, and now lives in Claremont, California. McKay Jenkins has been writing about humans and the natural world for just as long. His most recent book is What's Gotten Into Us: Staying Healthy in a Toxic World, was hailed as "a Silent Spring for the human body" (--Richard Preston, author of The Hot Zone). Jenkins is the Cornelius Tilghman Professor of English, Journalism and Environmental Humanities at the University of Delaware, where he has won the Excellence in Teaching Award.